The demand for sound control in the construction industry has risen sharply over the past decade – especially for owners and property managers of office buildings, hotels, colleges and universities, and buildings located near airports, train stations and busy highways. Improving sound control in buildings and structures requires addressing the windows. Outside noise travels inside a building much more easily through a glass window than an exterior wall. Therefore, the key to improving the acoustic performance of an existing building envelope is to upgrade its windows with sound control glazing. The applications for sound control windows are vast and provide numerous benefits, all of which contribute to a strong ROI. Minimizing outside noise in office buildings increases space value and tenant productivity. Reducing audio distractions in schools and universities provides students a better learning experience. Better sound control improves patient comfort and privacy in health care centers. It also provides a more comfortable stay for guests at hotels and motels, which leads to positive reviews and a higher occupancy rate. Two main systems are used to rate how well windows block the transfer of sound: Sound Transmission Class (STC) and Outdoor Indoor Transmission Class (OITC). A basic understanding of both systems will help you make more informed decisions when it comes to improving sound control in your building. STC: This system is most common method of comparing the acoustic performance of building products such as windows, doors and walls. The system was created to provide a single number rating for interior building partitions that are subjected to noises from speech, television, radio, office equipment and other mid to high frequency noise sources. The STC rating is calculated over the frequency range of 125 to 4000 hertz by comparing the measured sound transmission loss to a reference contour curve. The most important thing to know about STC ratings is: the higher the number, the better the sound control. OITC: This rating applies to low and mid frequency ranges, and is used to measure how well windows, walls and doors block outside transportation noises like planes, trains and automobiles. 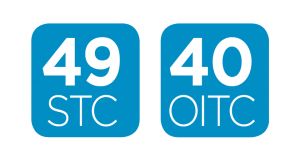 OITC ratings are particularly important for buildings located in busy metropolitan areas, or near airports, subways or other high traffic areas. Like the STC rating, the higher the OITC number, the better the sound control. What’s a Good Sound Control Window Rating? When upgrading the acoustic performance of an existing window, you have two options: replacement windows or a window retrofit that attaches to the interior of the existing glazing. There are several benefits to window retrofits. First and foremost, window retrofits are much more cost effective than replacement windows, which require the removal of glass, permits, scaffolding. Installing window retrofits requires less labor, which saves you money. Window retrofits utilizing a sound control system also perform better than replacement windows. The reason for this is the insulating air gap that is created between the existing window and the new interior sound control window. This air gap acts as a barrier that traps sound waves from traveling easily into the room. This can be observed in the table below, which shows independent laboratory test results of sound transmission loss in several Thermolite window systems. As the table shows, a single pane 1/4” annealed curtain wall window has a STC rating of only 31 and an OITC rating of 28. After a 1/4” Thermolite sound control window was placed behind the same window, the STC rating improved to 43 and the OITC rating improved to 33. Improving the sound control in your building has immediate benefits. For example, noise is the number one reason hotel guests decide not to return to a hotel. Guests staying in hotels located near busy highways, airports and train stations often experience loud conditions. These lead to more complaints, bad reviews and a lower occupancy. Assuring guests the luxury of a quiet stay is one of the easiest and most effective ways a hotel can increase its prominence in the hospitality marketplace. The same is true for other industries, including commercial office space, schools and universities, and healthcare facilities. Contact Thermolite today to learn more about how sound control windows can improve the comfort of the people who occupy your building facility.